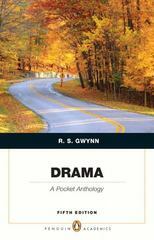 Drama 5 Edition A nice alternative to lengthier and more expense anthologies, Drama: A Pocket Anthology is the perfect choice for professors who want to see several books in an Introduction to Drama course. Chronologically organized, changes to the new edition include: Yasmina Reza’s Tony-winning comedy The God of Carnage , produced on Broadway with a cast including James Gandolfini and Jeff Daniels, reflects the robust strength of today’s Broadway and of contemporary comedy. Shakespeare’s Twelfth Night brings a classic comedy to this collection for the first time.